3 Essential Oil Healing Set. Let the scents from nature transport your mind and emotions to magical realms of wellness, bringing powerful and natural healing to you at all levels! 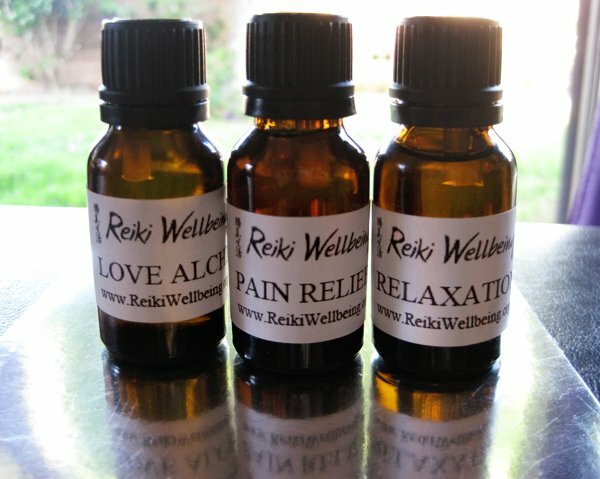 These Natural Essential Oils are of the highest quality, and infused with REIKI and Karuna REIKI®. Scroll down to see larger pictures! These are happy Essential Oils! Liquids store the vibrations of their surroundings. Sometimes they might have accumulated low frequencies. Because of this, I periodically purify them with Sound Healing, infused them with REIKI and Karuna REIKI® Energy and bless them with incense. Love Alchemy A combination of Jasmine and other romantic scents to evoke love, self-love, passion and harmonious relationships. Pain Relief An Acupuncture rubbing oil formula that can bring noticeable relief in muscular pain. You can dilute with a base oil (such as almond) if needed. Relaxation A combination of Lavender and other relaxing scents to find inner peace and tranquility.